There are so many burning problems which are posing major challenges to the mankind in this technologically advanced world, how many of such problems especially health related problems are you aware of? I am pretty sure you can list down at least ten on your fingertips in just a few seconds without thinking much. Diseases like diabetes, hypertension, sciatica, stress, obesity and other lifestyle diseases are some of the common burning problems. Among which Fertility is one such problem which every one in six couples is facing these days. The major reason of infertility in most couples today is poor lifestyle. You might know the fact that a nutritious diet and healthy lifestyle keeps many odds at bay…the same is the case with your fertility. Well, don’t worry and be depressed. It is never too late… You can at least start improvising right now, and I will just tell you how to go about it. Let’s get started with ways to boost fertility, but that is not possible until you boost your immune system. A serving full of good nutrition may give you that extra edge you need to conceive. So check out the foods that enhance fertility — that will enhance your fertility factors in both men and woman. Dairy products are rich in calcium, a nutrient that’s essential not just for bone health but also for reproductive health. They are one of the most preferred ways to boost your immune system. When you have some problems with ovulation, do intake good amount of dairy products in your diet. Some researchers think that one serving of whole milk can decrease the risk of ovulatory infertility, and they boost fertility naturally. But remember that just one serving of full-fat dairy a day is all you need. Any more than that will just pack you up on pounds. However, you may also need to maintain calcium levels before pregnancy and even during pregnancy that aids the growth of healthy bones and teeth of the foetus. You can also take calcium supplements as an alternative. Eggs are an extremely power-packed nutrition source that helps in increasing fertility. It contains Vitamin B12 and folate which minimises birth defects. In addition, it is rich in antioxidants and carotenoids that boost fertility in both men and women. That is why fruits, especially berries are considered to be beneficial foods that increase fertility since they help eradicate free radicals and prevent cell damage. Fatty fish is very efficient in boosting one’s fertility. It is a bank of omega-3 fatty acids, especially DHA and EPA. Fatty fish such as salmon, sardines and herring have really some big, fat fertility-boosting benefits. They may help you to regulate reproductive hormones, increase blood flow to your reproductive organs and relieve you from stress that is one of the major known causes of infertility. But, what if you’re not a fan of fish? Well, don’t worry, we have a solution to it……You can get omega-3 fatty acids from other fertility foods such as flaxseeds, walnuts, pumpkin seeds, eggs, etc. You can also compensate them with omega-3 fatty acids supplements or fish oil supplements. Oyster is famous for being an aphrodisiac and best part is; it contains zinc that is crucial for conception. Zinc also exhibits good antioxidant properties. Zinc deficiency can disrupt the menstrual cycle and slow the production of good-quality eggs. If you can’t eat oysters supplement it with other zinc containing foods like poultry, dairy, nuts, whole grains, etc. or else consume zinc supplements. Garlic health benefits are well-known but various studies have shown that it has aphrodisiac properties and also helps improve blood circulation. These are the natural ways to boost your immune system which in turn boosts your fertility. So it is always better to add foods containing antioxidants, omega-3 fatty acids, carbohydrates, lean proteins, iron, vitamin B12 etc., to your diet. This increases your chances of conceiving and thereby reducing the problems of infertility. 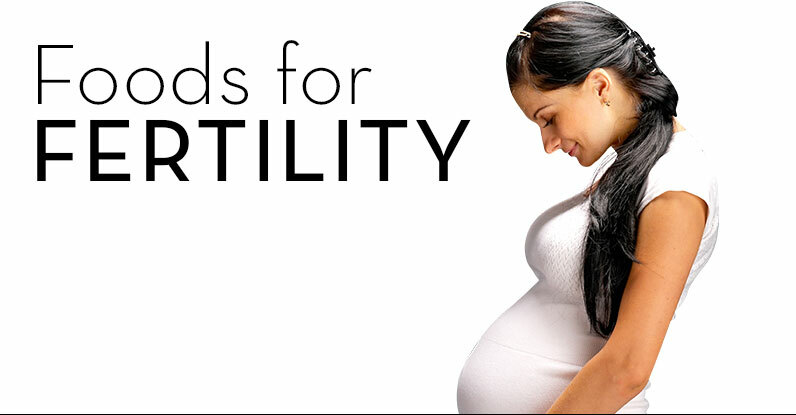 It will not only help you to speed up your fertility process but also ensure a safe, healthy pregnancy. So instead of spending a lot on medications and worsening your situation its better you understand the importance of fertility factors out of which nutrition plays a major role and spend wisely on foods which may give you more benefits. So start implementing the above said right away! Do share this valuable information with your friend or colleague whom you know might be facing this problem and bring a smile to their parenthood.